Veterans Day is a day set aside each year to honor our armed forces for the sacrifices they make to keep our country safe. These brave men and women give up their personal freedom to take the ultimate pledge to serve and sacrifice for our country. On Veterans Day there will be parades, events, television specials, and news stories. Many retailers will show their appreciation to veterans by the way of free meals or discounts. Those brave men and women deserve at least that! They give up so much to ensure that we are all kept safe! But then, what happens after today? Do we wait until this time next year to be thankful for their service? In my opinion, our appreciation should be shown more often. If these men and women are taking time to defend our country every day, then shouldn’t we take the time more than once a year to let them know how much their service means to us? One day last week I stopped by Food Lion on the way home. As I walked through the entranceway, I passed by a man in uniform who had just checked out. I turned around to see him organizing his bags so that he could leave the cart behind. As he picked up the first bag, I walked up to him and extended my hand. As he shook my hand with his free hand, I said “Thank you very much for your service. I appreciate all that you do for our country.” He was shocked. I am not sure if I was the first to do that, but either way he didn’t know what to say. He just smiled and said, “You are welcome and it is my honor.” Wow! I was blown away that he said it was his honor to serve our country, and all I could think was that it was an honor to have met one of the many heroes in the armed services. I smiled, and as I walked past the registers, several people just stared at me. Not sure if it was my hair sticking up out of place or if they couldn’t get over what I had just done. I smiled again, as I hoped my act would move them to do the same. This man had been shopping in their store and I am sure I wasn’t the only person to notice that he was in uniform. Shouldn’t this be commonplace? 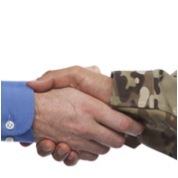 When we see someone in uniform, shouldn’t it be common to simply extend our hand and thank them for their service? Or have we all just gotten so busy that we don’t have time to stop for a few minutes to appreciate the bravery of others, their patriotism, their sacrifice? It’s a simple gesture that only takes only a few minutes of time to show that we appreciate all that they have sacrificed for us, our families, and our country. When you see someone today or any day in uniform, take a few minutes to thank them for their service. It’s the least we can do after everything they have done for us. Thank you to all those that have served or are serving our country!! God bless each of you! For a list of retailers offering free meals or discounts for veterans on Veterans Day, visit: http://themilitarywallet.com/veterans-day-free-meals-and-discounts/. This entry was posted in Holidays, Katie Austin and tagged every woman blog, Katie Austin, lexington medical center., military, Veteran's Day by lexingtonmedicalcenter. Bookmark the permalink.